It makes no difference if you have an internet site, brick and mortar store, or a work at home business, it is a fact that none will succeed if nobody knows you’re there. Advertising IS the key to success; however advertising doesn’t have to cost a fortune! Of course, the big display ads cost advertisers many thousands of dollars, and “pay per click” advertising on search engines can add up to big dollars very quickly if you’re not carefully targeting proper key words and keeping track of the results of your advertising dollars. There are many ways that we can promote our businesses literally for PENNIES, that can rake in THOUSANDS of dollars in sales. Listed below are just a few ideas that work well, and I’m sure you’ll be able to come up with additional ideas once you start working with these. ** FREE AD ON YOUR ENVELOPES. You can either use labels, or glue or tape one of your “mini-flyers” on the back or front of each envelope and package you mail out. There is no way of knowing how much “free” advertising these mini-flyers will generate – after all, you’re mailing the letters and packages anyway, so why not take advantage of that and give your advertisement a “free ride”. ** ENCLOSE SALES LITERATURE in all outgoing orders. If you already have a business where you send out orders, NEVER send out a “naked” package! If you simply enclose the customer’s order and receipt and mail the package, you are missing out on one of the very best sales tools available! Any additional sales literature you can enclose in the package (other items you offer for sale, information on another website to visit, etc) could bring you extra sales. It is a well known fact that if a customer buys from you one time, they’re more likely to buy again and again, if they are satisfied with your service and products that they bought in the beginning. ** BUSINESS CARDS are one of the cheapest methods of advertising that I know of. Many times, people will have 1,000 or more business cards made, then put them on a shelf and never use more than a dozen or so. If you have a business or website and don’t have business cards – GET THEM! Hand out the business cards to prospective customers, leave one on the table at the restaurant when you go out to eat. Many restaurants and other businesses have a location where you can put a small business card holder with several of your cards in it for future customers to see and pick up as they pay their bill. ** SCREEN PRINTED SHIRTS. This also is a “one time” purchase that will last for years, and will be read by people wherever you are walking – through stores, standing in line at a check out register, etc. These don’t have to be fancy, just “to the point” so people reading them will know what they represent. I saw one a few days ago that simply had a pair of glasses on it (the logo of the website) and the words “Specterweb.com” — everybody knows to put the http:// in front and in this case I wrote it down just so I could go there and see what it was (and this will work the same way for you). You can make enough of these shirts for you to wear, or perhaps some of your family might want a “free” shirt (they will be advertising your website when wearing it), or you always have the option of selling or giving them to customers as a free gift for placing an order. As you think about these suggestions, I’m sure you’ll be coming up with additional ones that you can use. Remember, advertising is a MUST for any business, but it doesn’t have to cost a fortune! The tips are just a few from our book, “Jumpstart Your Business With Proven Techniques and Strategies“! Check out the book – read the table of contents – then see how YOU can get your business moving ahead. Regardless of what size pattern you buy for your plus size/overweight child, there are always changes that need to be made. Sometimes a single change will do it, and other times there may be 2, 3, 4 changes necessary before the store bought pattern will actually fit the plus size child. We are starting a series of alterations to patterns that may be needed in order to get the fit you want for your plus size child. The first clothing garment we will work on will be the skirt. Many of the overweight children have a large protruding stomach, so we’ll start with that issue. LARGE ABDOMEN (stomach) – the skirt will be too short and will ride up in the front. Draw a horizontal line across the fullest part of the abdomen on the pattern as indicated. Cut the line beginning at the center front and cut to within 1/2″ from the side seam. Separate the pieces the necessary amount and tape in place, as shown. Redraw the center front line, as indicated with dashed lines, from the bottom to the top, keeping the original line straight. This correction will make the waist larger so you will have to make the “fullness” into a small amount of gathers, which would give a little extra fullness for the large tummy. A. WAIST/HIP – check your child’s waist and hip measurements and compare them to the measurements on the pattern. If the amount of change is the same for both, make the necessary change at the center front and center back lines. draw in the new skirt lines as shown with dashed lines. B. LARGE WAIST – To make just the waist larger, extend the front and back waist line each 1/4 of the total necessary amount. 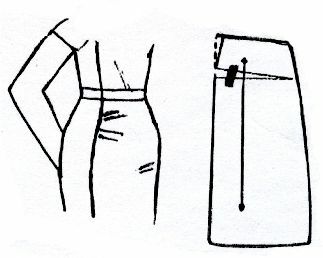 Draw in the new waist to hipline curve as shown with dashed lines. 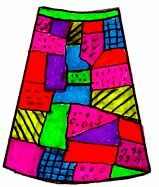 These alterations to store bought patterns is an excerpt from the book “Altering Store Bought Patterns For Plus Size Children”. 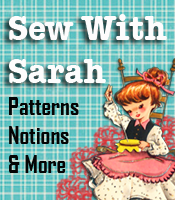 Additional pattern making classes (for boys and girls) and full size clothing patterns for plus size children can be seen at Sew With Sarah.com (pdf/downloadable patterns in “sewing patterns”) and PlusSizeChildren.com for patterns already printed and ready to mail out. If you have a lot of plus size children in your area, you might want to consider going into a business sewing for them – check our our Sewing For Plus Size Children As A Home Business manual. Whether you’re making new clothing items, altering outgrown clothing or just want to add something “extra” to a childs’ garment, we have a few suggestions for you. When my daughter was in elementary school I made “patchwork” pants for her as well as a “patchwork” jacket. Her friends LOVED her special clothing, and immediately I started getting calls from the mothers asking if I could make their daughters “patchwork” clothes like my daughter had. These are easy to make and can use up some of your scraps! Cut your skirt, slacks or jacket pattern out of muslin and sew in any darts. Next, arrange your fabric scraps to cover the muslin pieces (begin at the top and pin the scraps as you go, overlapping them as you work your way to the bottom). When the muslin pieces are covered with fabric scraps, take it to the sewing machine and do a satin stitch all around each piece, securing it to the muslin. After securing all the fabric pieces on the muslin pieces, sew the slacks, skirt or jacket pieces together. Add a zipper, waistband and hook/eye closure as needed for that particular garment. Children love these “patchwork” garments! 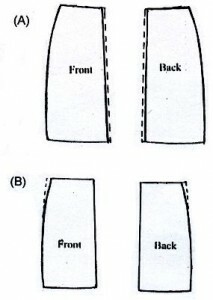 ** A “different” way of lengthening a child’s skirt or dress is to cut OFF the hem, then insert a wide band of lace or trim and sew the hem back on under the trim. You might want to add a piece of the same lace or trim on a pocket, or make a design out of the trim to place somewhere else on the skirt or dress to make it look like it “belongs” there rather than being an addition. 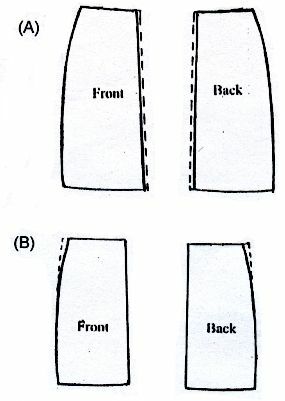 ** When making elastic waist skirts, shorts or slacks for children, if you sew a small square of contrasting colored fabric at the center back casing (where tags would be if the garment was purchased), it will be easy for the child to tell the front from the back when dressing. **Don’t give away your old clothes when you clean out your closet. Your “last year’s” styles and designs are not worn out – maybe just outdated. Use these clothes to make a wardrobe for your child. See the book “Make a Child’s Wardrobe From Your Old Clothing” for a multitude of ideas. **If you’ve made a fancy dress for that “special occasion” picture of your child, try making a padded fabric picture frame from the same fabric. This special photo makes a great gift for grandparents. 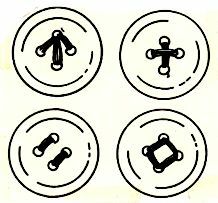 ** To help prevent loss of buttons on purchased clothing for children, reinforce the buttons with dental floss BEFORE the children wear the garment. The buttons will NOT disappear from the garment. The above tips are from the 500 Kwik & Easy Sewing Tips book. Check out the “sneak preview” of other tips in the book and what people are saying about it.